This pasta has become a weekly staple for a few months now. Zach (my husband, if you’re a new reader) does not love pasta because he feels very full and heavy from it. This is actually a common symptom amongst most people as added cheese, starches, and fats leave you feeling slightly sick and ready for a nap. So, with added protein in the pasta itself, I didn’t have to add a meat or cream sauce. We have been loving GoGo Quinoa’s Super Grain Pasta (find it at Costco), or as always, pastas with lentils and chickpeas as the only ingredients. 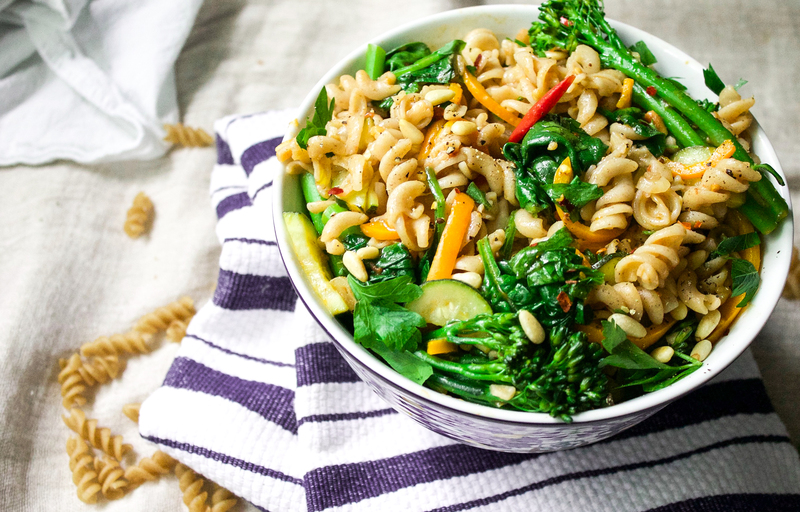 The key to this vegan pasta dish is the cooking water from the pasta. The starches left in the water create a creamy sauce without any added dairy. 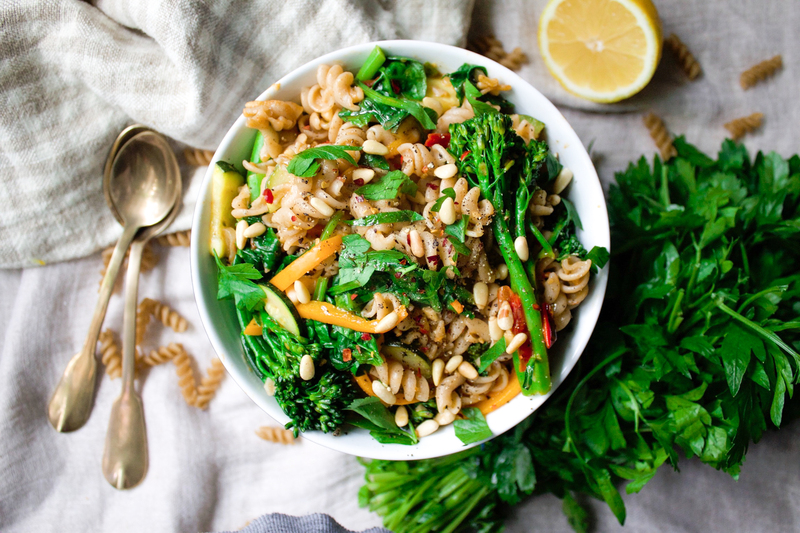 In 30 minutes you have a light pasta dish that is full of nutrients, protein and is of course, delicious. Feel free to use whatever vegetables you have on hand. I hope you love it as much as we do! 1. Cook pasta according to directions. Remember to reserve 1 cup of the cooking liquid after the pasta is finished. 2. While the pasta is cooking, prepare all of your vegetables and herbs. 3. In a large skillet, heat olive oil over medium heat. Saute shallots, oregano, chilli peppers, and a pinch of salt and allow to cook for 2 minutes, then add garlic and cook for another 30 seconds. Add your cherry tomatoes and bell pepper. And add about 3 tbsp of the reserved cooking liquid so that the tomatoes steam and the garlic does not burn. Allow to cook for about 5 minutes. 4. Add your zucchini, cook for another 3 minutes. Then add the broccolini and another 1/4 cup of the pasta water. Cook until the broccolini is tender and the tomatoes have begun to burst. 5. Once the vegetables are cooked through, reduce the heat to low and add the pasta to the skillet along with the rest of the reserved cooking liquid. If your skillet is too small to add the pasta, transfer everything into the larger pot you cooked your pasta in. Stir the vegetables, pasta and cooking liquid until the pasta becomes creamy and no water is left. Add your lemon juice and spinach. Taste and season if necessary. The salt from the pasta water might mean you don’t need to add any salt. 6. Serve pasta and top with toasted pinenuts, fresh parsley, more freshly cracked pepper and a drizzle of your best olive oil. Bon appetit!